I’m going to use a term that my 13 year old daughter Lauren uses… “Oh My Gosh!”, it’s finished! Christmas has come early, I have a complete Raleigh Team 753!!!! December started on a bit of a low as I finally decided to sell my SB track frame SB447. This track frame went to a very good home and will be built into a brilliant bike instead of gathering dust in my spare room. I finally built the front wheel yesterday to complete it and stand it on it’s tubs for the first time. So, since my last post, as you can see, I’ve built the wheels. I’ll add another blog post in the new year about those. I tried to stick to a customer build spec written by Gerald O’Donovan to a customer in 1982, describing the kit being used by the road team. As my bike was 1980, I thought this was close enough, but maybe the 1980 spec was slightly different? I just don’t know. That letter stated 32H for normal roads (or 28H for ‘decent’ roads). 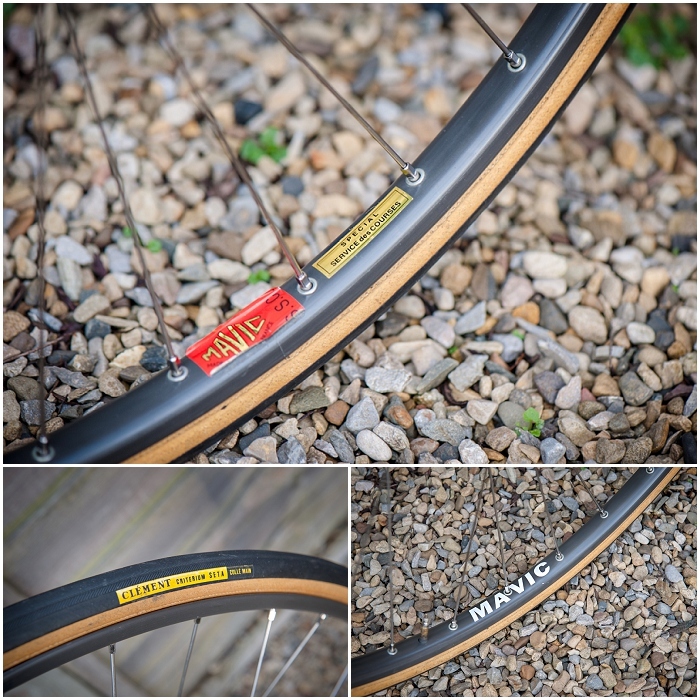 It also spec’d Mavic SSC and Clement tubs. My problem is that I wanted as much of this build to be New Old Stock (NOS) parts. There were some SSC rims up for sale, but they were used and showed it on the walls of the rims. Finally, I found some NOS Mavic SSC but in 36H. I already had the 32H Record Hubs but thought that I may never get another chance to wait for NOS 32H rims, so I snapped these up. I now had 36H rims and 32H hubs – the only thing I could do was get 36H Record hubs instead! The original SSC stickers are peeling slightly but are ok for now. The original white M.A.V.I.C stickers had almost all gone, so these were replaced. But most importantly, the rims have never been built so no brake rub. Raleigh spec’d chrome berg union spokes. This is one of the only areas that I didn’t want to stick to spec. From the mid 80’s to the end of the 90’s, all my wheels have been built with Swiss DT Stainless DB spokes. They look great, build great, keep tension and stay looking good over the years. I’ve seen so many pairs of quality wheels come through the workshop with rusted and brittle chrome spokes that were cut out and replaced with stainless. I’ve simply gone to stainless sooner. Finally for the wheels, the spec listed several different types of Clement tub. I couldn’t find any that wouldn’t break the bank, so decided on some NOS Clement Criterium Seta. An absolutely fantastic wheel set. Also since my last post, I’ve found some cable ferrules for the divers helmet stops that enabled my to fit the rear brake cable. I also, thanks to Steve Kurt, got some genuine white Benotto tape. This has been wrapped around the NOS set of Cinelli bars with a 66 bend and 44 width (nice and wide). 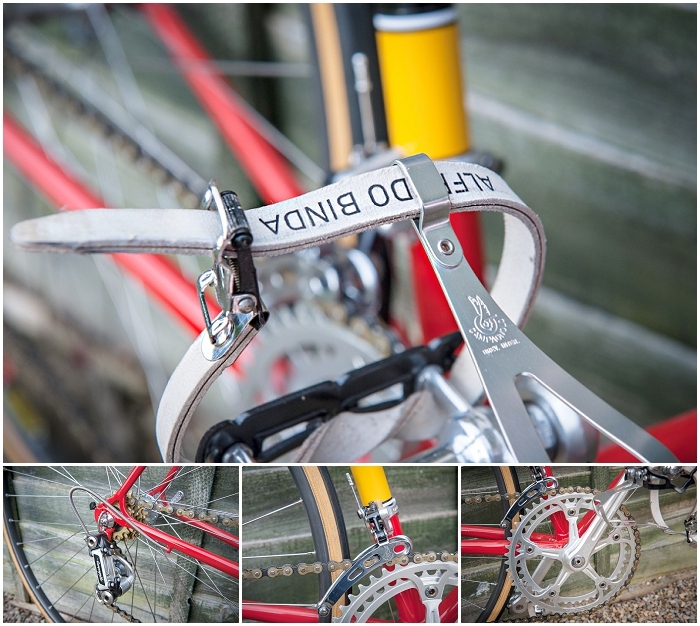 These are held with a NOS Cinelli 1A stem – all as per spec. I had to decide between finishing the tape with either red or yellow tape. After looking through the Raleigh 125 Year book, there were loads of images of red tape – but some of Joop in his yellow jersey in 1980 with yellow tape. As mine is a 1980 frame, I decided on yellow. That colour goes well with the yellow on both the frame decals and yellow clement name on the tubs. I was lucky enough to buy a NOS brake set which included the cables. The hoods were in perfect condition, and as it was NOS, there is not a mark on the brake shoes and cables are uncut. Everybody has a preference on which side they fit the front brake. A really old and ‘silly’ British Standard from the bike shop days is that the front brake must be fitted to the right hand. I fit my front brake to the left hand. It is the natural curve that the cable needs to take to find it’s way to the caliper. My cables loop out nicely from the top of the levers, cross over just behind the stem and follow on to the calipers. A part that I thought would be relatively easy to source were toe straps. Strangely, these were the hardest to get. 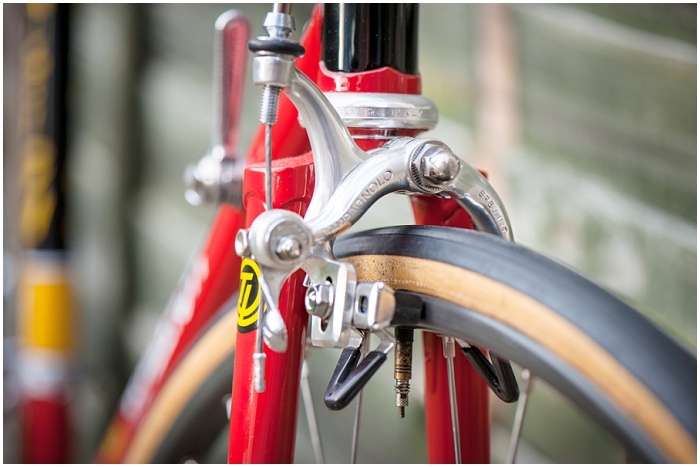 G o’Ds spec was for Nouvo Record steel axle pedals with Sturmey Archer clips and straps. The pedals were not a problem, although I didn’t buy NOS – people just want too much money. I have some very nice mint unmarked used examples. I’ve seen maybe a couple of examples of Sturmey Archer clips and never found any straps, so I’ve had to go for some lovely NOS alloy Campagnolo clips and eventually, some NOS Alfredo Binda leather straps. After months and months of looking, I finally found a pair of straps for less than £1oo. These pedals are attached to mint cranks (with the all important 1980 date mark on the reverse). A NOS front mech and a NOS Pat 80 Rear mech complete this. I’ve really enjoyed building this bike over the last 2 years and don’t intend for this to be the end of the blog just because the bike is complete. Starting in the new year, I will be doing individual posts about all the major components, breaking them down into sizes, weights, specs, threading, fittings and assembly etc, plus a post on building these wheels, including measuring for spokes, lacing, adding tension, truing and dishing. I hope everyone has a lovely Christmas 2013 and New Year. Looking forward to 2014 so I can finally ride my bike! That’s what it is all about! wow.. that looks incredible! So many details to attend to, and they all came out great! 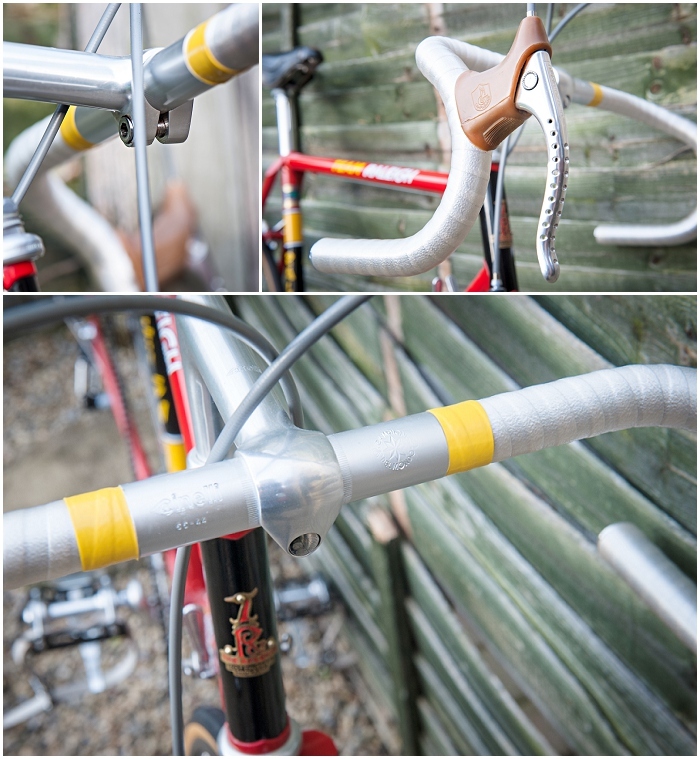 Glad that the Benotto tape worked out, and nice to see that it ended up on such a fine bike! Thanks Steve. I didn’t think when I started this that it would be a worldwide search for parts but bits have literally come from all over. The Benotto tape is just perfect. I had almost given up hope of finding White Benotto but glad I asked one last time! Wow, this takes me back, such a fine machine 🙂 I raced on the very same bike 82-85 as a junior, but 531 not 753 but the rest was much the same. Are you going to search for a cinelli saddle to finish it off 100% or is the brooks a personal favourite? Hi Simon, thank you for the comments. The Brooks was just what I had in the house to complete the build as I’ve spent a long time looking for a saddle to complete it. They spec’d either an Iscaselle or Cinelli and I have found an Iscaselle Tornado which should be here in a couple of days. Even though the Brooks has titanium rails, it’s still quite a weight. I kind of get the idea of hunting down NOS parts for a build, but not enough to pay the price, except for those rare cases where they are affordable, which things like an NOS set of Campy brakes rarely are. It’s your bike and you don’t ever need to defend what you do with it, and we’re really not talking about a lot of money in the grand scheme of things. The cost of building up a brand new 40-year old superbike is still much less than that of purchasing a new, modern superbike and it may be a whole lot more fun to ride. Still, I prefer to find parts like your pedals and cranks that are not new, but are in excellent, low-mileage condition (as long as I also save money, of course). I want to ride my bikes, and something I build entirely out of NOS parts would almost certainly become a wall ornament. Not that there is anything wrong with that, but then I’d want two of the same bike–one to look at and one to ride! There are, of course, many parts that are almost always best to purchase NOS, including chains, spokes and anything pliable, If you can get a good look at the wear surfaces of sprockets and bearing races before you buy, you can usually tell how much service life is left in a part. We had many a brake cable routing discussion, back in the day. Some argued that the stronger hand should control the front brake, as it does most of the actual stopping of the bike. In the shop, we never did it that way, due to the fear of having a customer apply the front brake incorrectly (such as when on a loose surface in a corner). With the custom and expectation in the US that the front brake would be on the left, we were concerned about the potential to contribute to an accident, should the rider forget or loan the bike to another. As a mechanic, I developed a strong enough grip that it was irrelevant which hand was stronger. I felt that my left hand was more sensitive and better able to modulate the front brake, while the increased grip of my right helped to overcome the extra friction in the longer rear brake cable, which is a real concern with the unlined cables of the day. On the chrome spokes, they do have a different look than stainless–not better, just different. Stainless have a slightly yellow look, probably due to the nickel content. I don’t think I’ve ever had a wheel with chrome spokes that didn’t break spokes frequently, except for a tandem that has 12 ga chrome spokes (Union, I think). I’ve always understood their this to be due to hydrogen embrittlement, resulting from the chroming process. I have a bunch of new Union chrome spokes, so I (probably stupidly) rebuild wheels that originally came with chrome spokes with the same, but it’s not at all a surprise when I’m riding an old Paramount to hear that telltale “POP,” and feel the wobble of a 35-spoke wheel. Yes, we’ve all seen rusty chrome spokes, but they won’t get that way if you store your bike in the proper environment. Believe me, there are lots of NOS parts out there and lots of people who are raking up the prices of them. I just wasn’t prepared to pay some quoted prices. With the NOS parts I got, I think I did ok. With things like the brakes, I had to weigh up that if I bought used brakes, would I have to buy new hoods, would I have to buy new brake shoes, new cables. I probably saved money buying NOS at a reasonable price than buying used and refurbishing them. Completely agree with brakes. Like you, as a mechanic, I rode lots of different bikes and setups. I can very quickly get to grips with what side the front brake is on. “Front brake side” was always a question on the build sheet for custom builds. Hi Niel, Love the bike, I managed to get hold of a frame off a friend of mine who had had it under his bed in bubble wrap for 20years, I spent a long time like yourself trying to source parts, I already had a collection of bits and pieces in my garage from my racing days,which were in good condition but bought quite a few super record chainsets until i got the best one ! bike turned out great and is hanging on display in MTS cycles in Durham if you have a look on their gallery its listed as mikes Raleigh or i will try send you some pictures later. Thanks for the comments. Just had a look at the gallery; you have a lovely bike – it stands out a mile from all the carbon bikes on there. I don’t understand how people keep frames like this under a bed for 20 years though! I’m the same, there are a few parts on mine that aren’t NOS, like the pedals, so I’ll always be on the lookout for better bits. 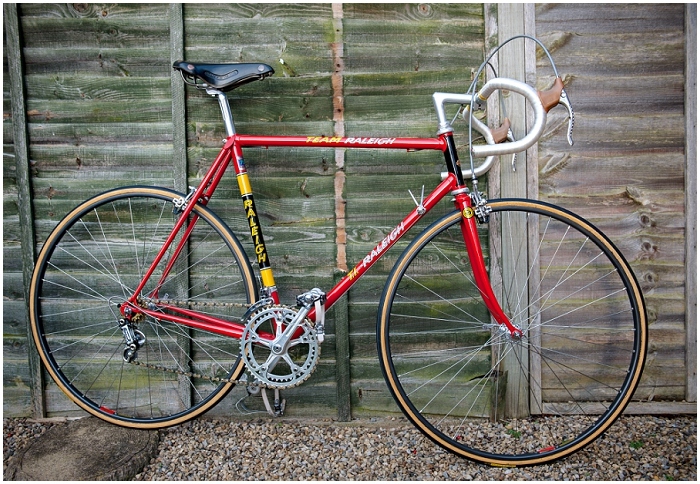 I’ve just taken the Brooks saddle off as I’ve found a NOS Iscaselle Tornado which the TI Raleigh team spec’d. It’s nice seeing other Team bikes – not many of them around now. A thing of beauty is a joy for ever. Enjoy your rides in 2014. You’ve really done an amazing job on this frame, absolutely spot on. I’d like to say that I’ve finished the track frame I bought from you but it’s not quite there yet – I’ve gone for Dura Ace 7400 stem, seartpost and front brake, brooks saddle, cinelli bars, mavic wheelset & vittoria open corsas. Not quite on the same level as your build but a beautiful bike nonetheless. I will see if I can get a picture up here in a few months time when it’s all finished. Nice to hear from you again. I’d love to see some pics of that frame built up. I did regret selling it but it would have just sat doing nothing with me, so I’m really happy it is getting a new lease of life and will get ridden again. I’m building my other Ilkeston road frameset up tomorrow. Just managed to get together a Shimano 600EX groupset. I’ll have pics of that up soon too.